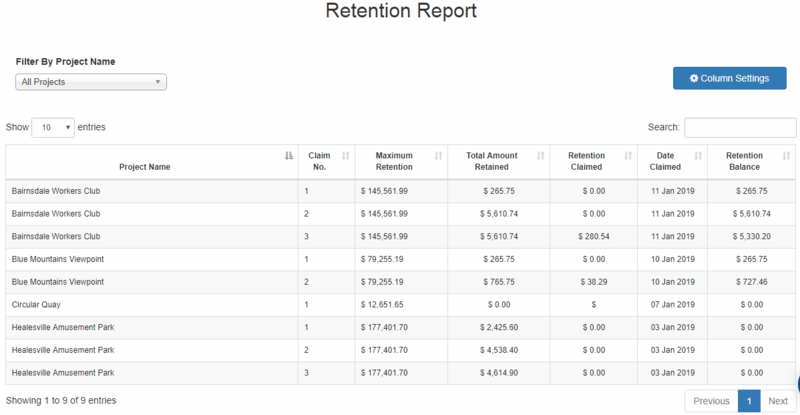 With the help of Retention Report, you can keep track of all your retention amounts from your projects. 1. From your navigation bar, go to Management > Reports > Retention Report. Or type in 'Retention Report' on the search bar in the upper right corner of your portal. Note: Make sure you have allowed Retention Report on the User Access page. 2. The Retention Report page will be displayed. By default, it shows retention of all projects. 3. You can filter the report by Project Name. 4. You can sort the results in ascending/descending order by clicking the Column Header. With the use of Show Entries, you can control the number of entries you want to be displayed on the table. 5. Click Column Settings to modify the displayed columns on the table. 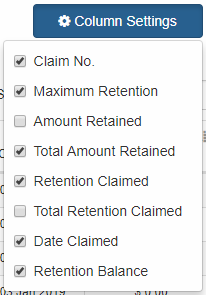 By default, the Amount Retained and the Total Retention Claimed is hidden. 6. If you want to search a specific data, you can use the search bar provided. 7. Click Export to Excel button to download the table in excel file.